The employee welfare schemes act as a morale booster. When the employees get an appreciation for what they do, it helps in increasing the work efficiency of the employees. When the work is done lauded by the organization, it proves lucrative to both the company as well as the employees. If the work done by the employees is not appreciated, the output might not come as expected. So, it is essential to have employee welfare schemes. The employees work only when they are motivated to work. If the company wishes to get 100% output, then it is the company which has to put in little efforts to encourage the employees. No one else would deliver the expected results. So, in order to boost the morale of the employees, it is essential to offer employee welfare measures. Competition is must if the company wants employees to work well. In order to form a competitive environment in the office, it must provide employees with opportunities. The competitive edge in the work environment can only help in getting the required work from the employees. So, if the healthy work environment or the healthy competition is required within the organization, it is vital to provide employees with welfare schemes. If the companies want the employees to give the result on time or deliver the work in time, there needs to be some extra effort by the company so as to encourage the employees to give timely work. This can be done only when the employees are encouraged apart from praising their work and given some welfare schemes. If the extra work is expected from the employees, they should also be given extra benefits by the company. Only then the timely results could be expected by the company. The employees when benefited, results in good industrial relations too. Not just the work output is good, but also the amiable relations are built by the employees when encouraged through various schemes. So, various employee schemes are essential to make employees work in a better manner in the company. The employees when given different facilities at work; it improves mental health as well as helping in becoming a good citizen. So, it helps in overall development of the employee. Employee development is equivalent to the development of the company. So, if the companies want themselves to grow, they need to help employees in their growth. The employees also get various social benefits which are advantageous to the company also. The social benefits increase the productivity, production as well as the work efficiency of the employees. The good work by the employees also helps in increasing of the remuneration. Finally, this helps in increasing the standard of the employees which is appreciated and accepted by everyone, indeed. The employee welfare schemes invite more employees within an organization. This is one of the good ways of recruiting employees. If your company has less staff then these schemes are enough to invite more employees within the company. More the employees, more will be the vacancies filled and the work will be done in proper order. Ultimately, it will benefit the company only. The work will be executed in the proper order so, for this reason it is essential to initiate various employee welfare activities schemes in the company. The benefits to the employees urges the other employees to work better. It creates a competitive edge and helps in the growth of the employees. The employees who get such schemes makes the other employees to perform better which creates a competitive environment in the organization. The schemes are a motivating factor to the employees and it helps in the overall growth of the employees. Both the common organizational goal and the personal goals are easily achieved by the employees, which benefits not just the company but also the members working in the company. The companies train employees to get good results. But if the employees leave the company early, it affects not just the employees but also the company. So, the company has to get some schemes to retain the employees for a longer time period and that is only possible with the employee welfare programs. The employees would not even think of leaving the company if they will get the required share of appreciation. So, it is better to give employees the welfare schemes. The employees work hard if they are given extra benefits. Benefits are never refused by anyone but appreciated by all. So, the employees work harder when given the great deal to work for. Salaries are the obvious thing to get but when given something extra, the employees work harder. So, above are some of the advantages of welfare programs. The benefits of employee welfare measures are more, direct to the employees than the company. However, it is important for the company to generate various employee welfare schemes. For every company to retain the employees, it has to bring forward various schemes. Neither the money nor the schemes should be the driving force to work for the employees. The employees must be motivated through the work done by others. A competitive environment should be the driving force for the employees to work. Only then, the expected work can be delivered by the employees. The company gets burdened financially as more the employees, more the budget will be required by the company to equally distribute the schemes among the employees working within an organization. So, in order to equally distribute the schemes among the employees, it is essential for the company to have proper a financial budget in order to provide employees with the required schemes. In order to remain in the market and to keep oneself on the edge, it is essential to keep good employee welfare policy so as to attract maximum skilled employees within the organization. Every company needs skilled workers to work so that they get better output. In order to do the same, the company will have to have an edge over the welfare schemes too. All the other schemes of the companies get outdated. Other here means the older schemes, does not exist anywhere. When the other competitive companies give the employees great and newly developed schemes, the present schemes seems a big failure due to which the other companies have to get the similar beneficial schemes. So, this kind of burden also kills the companies at large. If the company fails to provide the employees with great schemes, the employees may choose to leave the organization. So, to prevent the employees running out, the company needs to bring novel schemes and services for the employees. The employee welfare schemes increase the budget of the company which affects the company financially. The inclusion of the new schemes can upset the whole budget of the company which ultimately affects the whole working of the company. This is because it is not necessary that the company will always have extra finances to cope up emergencies. So, the employee welfare facilities are a great disadvantage for the employees themselves. When the competitive organizations give better welfare schemes, the employees may choose to reach the organization giving better opportunities. This way the employees may even leave the company and move on to the next. This also forms one of the disadvantages of the company as well as the employees on the whole. So, for this purpose, the company will have to keep great welfare schemes for the employees. 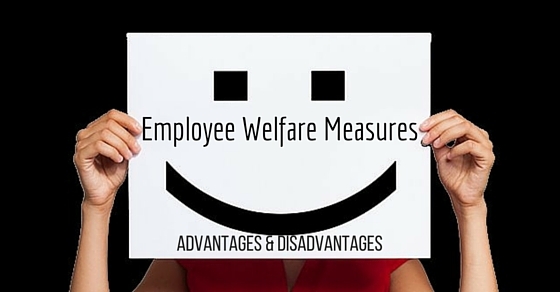 These are some of the disadvantages of having an employee welfare objectives. The schemes, however, help the employees more than the companies. This is because whatever is the scheme bought by the company, has to be funded by the company itself. So, this is the reason why the employee welfare schemes are a great disadvantage too.